As I’ve been working on my session for this Saturday, I’m referencing a metaphor for thinking about learning in terms of food, one of my favorite topics. Since I won’t have the time to explore this idea thoroughly in the session, I decided to expand on it here. 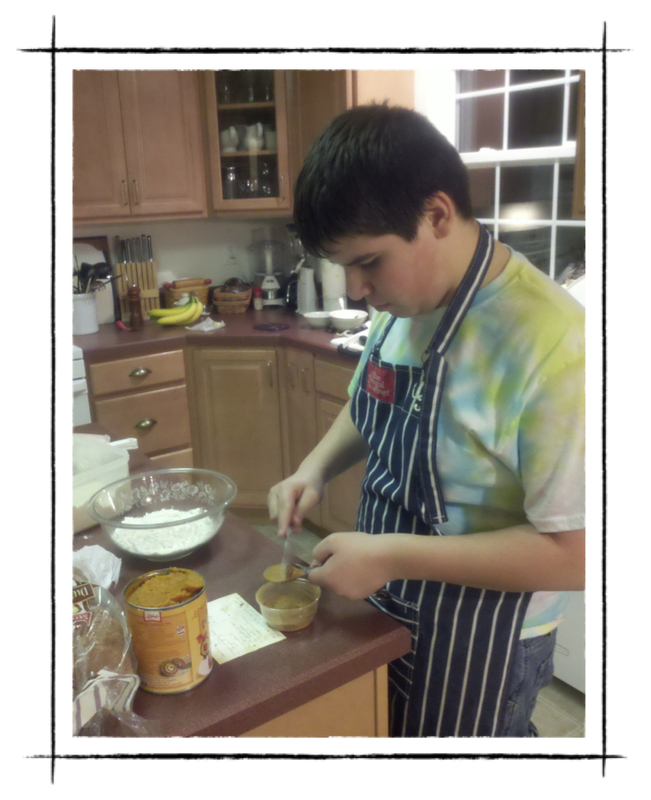 The photo here is my son, Tim, who has been cooking since he was young, and is now planning on a career as a pastry chef. He and I like to cook together, and we watch a number of different shows on the Food Network, which happens to also be my favorite cable channel. Wiggins in the above‐​reference post refers to the Understanding by Design framework of “TMA”: transfer, meaning‐​making (understanding), and acquisition of content. Wiggins talks about transfer as the ultimate goal of education, and goes into extensive detail about what it is and how to get there. As a way of helping us relate to these ideas, Swanson takes the three levels of learning and assigns each a cooking show. I’ll share and explain these shortly since they became part of my own model. In developing my presentation, I realized that there is a second dimension to learning, and that there are television shows which relate to these as well. Learners progress through the three tiers from acquisition to understanding to transfer as both consumers and creators. I believe that we have focused far more on consumption in our curriculum design, and while transfer can and does take place on this side, to stop there means to ignore half of the potential learning that could occur. Commis is the term used for a professional line cook: someone with good skills and understanding of foods and ingredients, but who is not yet ready to create a menu or run a restaurant kitchen. Briefly, here’s the rationale behind the choices. We start with “Triple D” (as host Guy Fieri calls it). This show is simply and wonderfully about finding good, casual food in accessible places around the country. While Fieri shows demos of how the food is prepared, there is no illusion that the home cook is going to replicate anything. This is the epitome of consumer acquisition: just collecting the information. Next we move up to The Best Thing I Ever Ate. Now the goal isn’t just to acquire knowledge. The critics on this show are trying to help you understand what makes the dish they are talking about the best example of a particular food or ingredient. They explain why a particular application is different, show the techniques that the chefs use to make them special, and describe not just the food but the experience of eating it. The pinnacle of the consumption side, where the transfer takes place, is illustrated by Bizarre Foods. Host Andrew Zimmern now takes his knowledge of food and cooking to places we have never been, trying things that we would likely never consider eating, and in some cases that we wouldn’t consider food. He makes these bizarre foods accessible by showing us how they relate to the more familiar dining experiences we’ve had, and shedding light on the cultures that create them. The transfer task in eating is being able to eat something you’ve never eaten, not just to say you’ve done it, but to enjoy and appreciate it. On the creation side, we start again at acquisition. Here the analogy is to the Rachel Ray show. Her goal is simply to give you the steps to creating a delicious meal. Follow her recipe from step A to step Z and, if you’ve done everything as described, you should end up with something very similar to what she made on the show. Alton Brown, on the other hand, takes things to the next level with Good Eats. Brown doesn’t just want you to be able to duplicate the dish, he wants you to be able to riff on the theme, so he explains how ingredients interact together, why certain techniques work the way they do, and where certain kitchen rules of thumb come from. He presents recipes, but he also gives you the information and skills to make intelligent and successful modifications to them if you want to. As Wiggins says, transfer is where we need to get our students. They need to be able to act, both as consumers and creators, with confidence and skill, even in novel situations which they’ve never experienced before. I agree, with the understanding that the path to transfer necessarily travels through acquisition and understanding first. But we need to spend less time there, and we need to be transparent with our students about what we are doing and why. Help them see from the very beginning where we are taking them; let them know what the transfer is and tell them how you are going to take them there. What analogies do you see here? How much time in your experience and opinion should we be spending on each of these “shows” with students? Is there a standard, or is it going to depend on other factors? How can we get more time for transfer and creation in the curriculum and instructional day?